"Ikebana" (means "Flower Arrangement" in English) is a Japanese traditional art that express not only flowers but the formation of its surrounding field itself using flowers as it alives. This work "IkeOto -Sound Arrangement-" is a visual and sound interactive art that stays its surrounding environment's sounds and sounds given by audience in the field, and present it as quite different form. 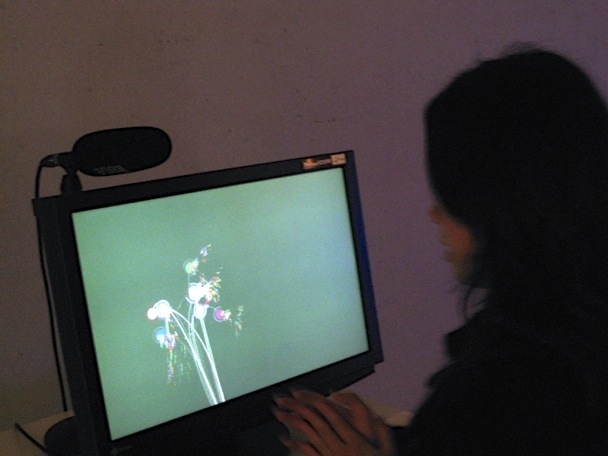 As a result, the special sound field is formed by sound instead of the flowers by leaving sounds, which disappears usually as time goes by because it doesn't have any substance.